Acupuncturists use natural pathways, called meridians, through which the body’s energy flows. Meridian therapy rebalances these meridians, so the energy flows properly. This helps your body work better and heal quickly. Based on the classical Chinese tradition, Meridian therapy in Japanese Acupuncture uses the concept of the 5 Elements as a model for healing. 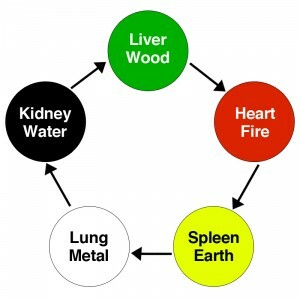 According to this system, the Universe is divided into Yin and yang, and then everything is seen as belonging to one of 5 elements: fire, earth, metal, water, and wood. For example, spring, new growth and the color green are part of the wood element. The acupuncture pathways that belong to wood are called the liver and gallbladder meridians. Symptoms of liver or gallbladder meridian imbalance include: anger, depression, vision problems, indigestion, irritable bowel, IT band tightness, migraines, PMS, stiff neck and shoulders, and much more. An imbalance in the liver or gallbladder meridian doesn’t necessarily mean there’s an actual physical problem with one of these organs. Each element, and its associated acupuncture meridians, has its own set of symptoms related to an imbalance in the system. In addition, the energy of these 5 elements circulates and controls each other in certain patterns that the acupuncturist can sense and modify to restore balance, which restores health. I first studied these methods with the master Denmai Shudo, the author of “Introduction to Meridian Therapy,” the most widely used intro acupuncture book in both Japan and the United States. I studied with Dr. Yoshio Manaka, the acclaimed Western physician, acupuncturist, and inventor. His innovative tools and techniques help me balance the meridian system to promote healing. I use his methods to treat internal problems, control pain, and address many other symptoms. For example, I frequently use “ion pumping chords”, one of his major inventions. First developed for burn patients in post war Japan, Dr. Manaka discovered their efficacy as a root (balancing) treatment. The cords connect to acupuncture needles at two points, creating a polarity with a directional flow of ions. Since Manaka’s cords literally pump ions, the cords are named accordingly. To learn more about Dr. Manaka’s work, I highly recommend Chasing the Dragon’s Tail: The Theory and Practice of Acupuncture in the Work of Yoshio Manaka (Paradigm title), by Yoshio Manaka.